In an attempt to coax the President of the Islamic Republic to comment on Iran’s views on the Jewish State, Channel 2′s Karen Marciano approached Rouhani as he was shuttling from one engagement to the next. “Mr. 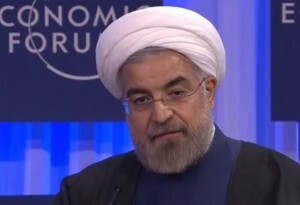 Rouhani, why did you not mention Israel today? Have you listened to [Israeli Prime Minister Benjamin] Netanyahu’s speech?” she asked. “Half of Palestinian society is dominated by Iran’s proxy (Hamas),” the Israeli Premier said Thursday at Davos.